The Cuban Revolution of 1959 was a benchmark of triumph and a harbinger of tragedy to come. Rather than herald a new era of Cuba joining the world community of nations as a paragon of democracy as many fervently hoped and believed it would, it became instead a new stage in authoritarian rule in the Western hemisphere.For more than a half century since then Cuba has been defined by the capacity of a single family to command and determine the fate of a nation�and to do so with a minimum of opposition. Incredibly, even those professing adhesion to democratic norms have been ready to forgive the dictator his excesses. 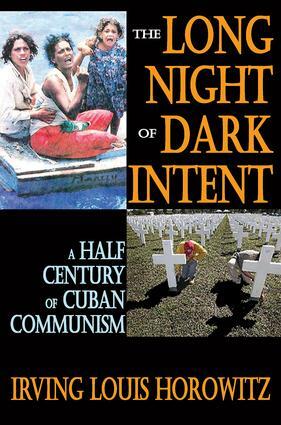 This volume explains the theory and practice of this absence of internal opposition and the persistence of external support for the Castro family and its entourage.The Long Night of Dark Intent is chronological in order, with the author indicating major points in each of the five decades covered. The volume covers five centers of system analysis: economics, politics, society, military, and ideology. Who or what "determines" events and decisions is the stuff of real history. It is precisely due to variability in causal chains in society that we have huge variance in levels of predictability. The course of the Cuban Revolution gives strong support for such an approach to the Castro Era. This is a unique, unflinching account with a strong emphasis on the importance of U.S. policy decisions over time.